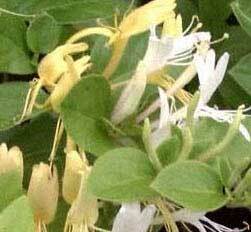 This quick growing evergreen vine is a good choice for fences or areas where it can be left to ramble. It also makes a good evergreen screen. After a severe winter, damaged foliage is quickly replaced. Scented white to pale buff colored flowers are produced from early to mid summer. It prefers light shade, but tolerates most aspects.